Automating repetitive surgical subtasks such as cutting and debridement can facilitate supervised tele-surgery, and reduce surgeon fatigue and procedure times. 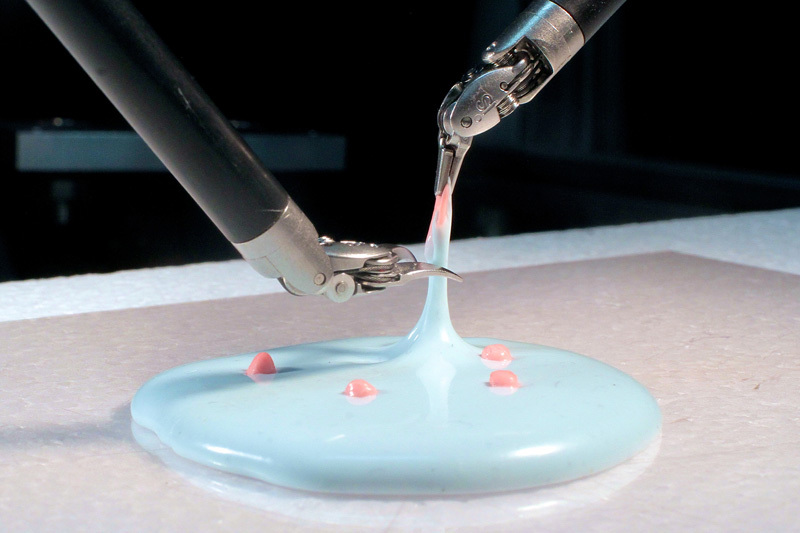 Programming these tasks can be difficult, however, in part because human tissue is deformable. Using the da Vinci Research Kit (DVRK) robotic surgical assistant, we explore a “Learning By Observation” (LBO) approach where we identify, segment, and parameterize sub-trajectories (“surgemes”) and sensor conditions to build a finite state machine (FSM) for each subtask. The robot then executes the FSM repeatedly in order to tune parameters and update the FSM structure. A video from UC Berkeley’s new Center for Automation and Learning for Medical Robotics (Cal-MR) demonstrates how the approach can be used to automate two surgical subtasks: debridement of 3D Viscoelastic Tissue Phantoms (3d-DVTP), in which small target fragments are removed from a 3D viscoelastic tissue phantom, and Pattern Cutting of 2D Orthotropic Tissue Phantoms (2d-PCOTP), a step in the standard Fundamentals of Laparoscopic Surgery training suite in which a specified circular area must be cut from a sheet of orthotropic tissue phantom. Initial physical experiments yielded a success rate of 96% for 50 trials of the 3d-DVTP subtask and 70% for 20 trials of the 2d-PCOTP subtask. Learning by Observation for Surgical Subtasks: Multilateral Cutting of 3D Viscoelastic and 2D Orthotropic Tissue Phantoms. Adithyavairavan Murali, Siddarth Sen, Ben Kehoe, Animesh Garg, Seth McFarland, Sachin Patil, W. Douglas Boyd, Susan Lim, Pieter Abbeel, Ken Goldberg, UC Berkeley. IEEE International Conference on Robotics and Automation. May, 2015.